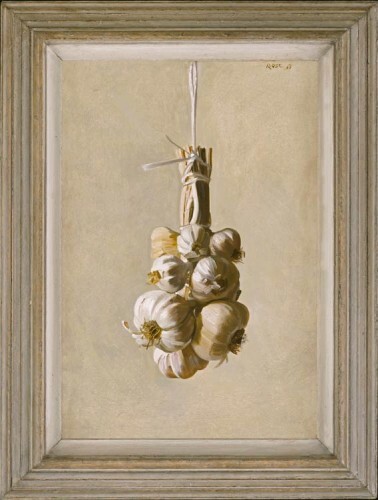 Another humble kitchen subject, garlic, like onions, surfaces in much earlier still life paintings, such as Luis Melendez’s striking Still life with bream, oranges and garlic, 1772, Prado. It creates a range of painting problems disproportional to its apparent mundane appearance: the papery skins, the shiny cloves like cream jade, the subtle range of colours, modulating from silvery white to pale fuchsia. Here, a twisted braid of garlic heads hangs against a vibrating, stone-coloured background, the white gesso base lending the latter a golden translucent glow from which the garlic stands out in solid sculptural globes.